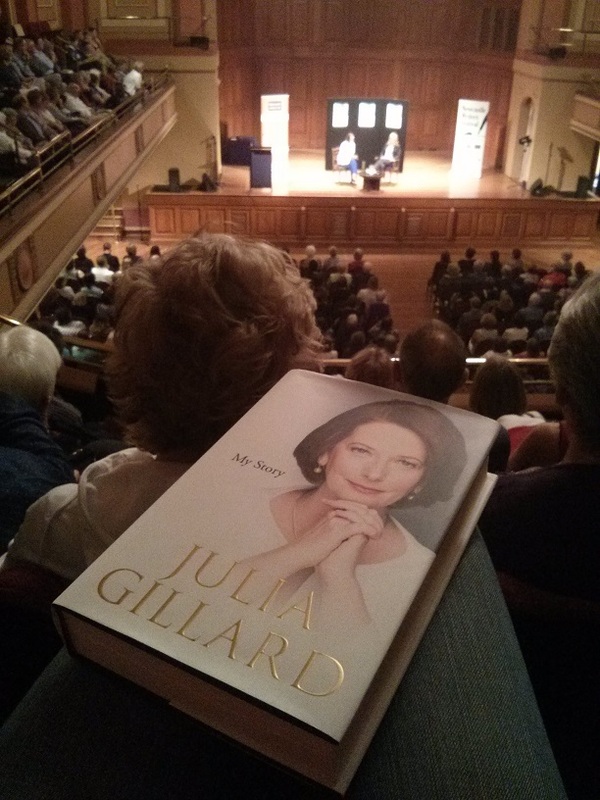 What I saw as Julia Gillard being cold was a dedicated public servant simply trying to do her job. What I saw as unemotional was a person simply avoiding being reported as a hysterical woman. This morning my mum and I headed to City Hall, bright and early, to Julia’s second Newcastle session on her book tour (she added today’s session when last night’s sold out in a matter of minutes). On stage she was relaxed and candid, making jokes and speaking openly with the audience. In a way, she looked like she was enjoying herself, able to spend time with people who supported her without the critical spotlight the Media. The roar of applause at the end of the session was genuine. I can’t help but feel proud that I witnessed this historic moment in time where our country was first led by a woman. Julia spoke of purpose. She said that without purpose you won’t get anywhere. With purpose, you can achieve anything. Purpose got her through all the obstacles to first get into politics, and purpose kept her going through those difficult days in office. It made me ask: so what’s my purpose? And in particular, what’s my purpose when I write? I’ve been thinking about this all day. I write to make people think differently about something, to question their prejudices. I spoke about this in my recent blog hop. I think this is more easily achieved in short stories – they are more focused – but harder to define in longer pieces. I’ve just started re-writing my novel with a hope to get it published one day, so this is a good time for me to stop and think about the purpose. What am I trying to achieve? If my answer to this is ‘I want to be published one day’ then I am destined to fail. That’s not enough to drive through obstacles and overcome criticism. If Julia’s purpose was simply ‘to lead the country’ her success would have ended the minute she became PM. Like my novel, this statement is a work in progress. I’ll no doubt add to it and play around with the wording as I go. But my novel now has purpose, in turn giving me purpose. And according to Julia Gillard that’s all I really need to help me succeed. Having a sense of purpose for our lives in general, gives meaning to the tests and challenges we often encounter and to the joys we sometimes experience. To be purposeful in all our endeavours, large and small, helps us to fulfil our goals and objectives and to achieve worthwhile things. You’ve reminded me to consider the purpose of my writing too – thanks for that, Jessie. And by the way, my daughter and I came across Julia in Big W at the end of her book-signing there – she graciously signed a copy of her book and posed for a photo with my daughter. Lovely! That’s right Di – you’ve summed it up perfectly! So good you got to meet her in Big W. At the City Hall book signing there was a strict rule about no photos because they took too much time, but Julia broke the rules for a couple of high school students which I thought was lovely. Her focus is very much on education and the next generation of leaders… I like that.